When I first started my blog, I thought that Pinterest would be one of the hardest social media platforms for me to tackle. I knew so little about it, yet I’ve had an account since high school! I thought Pinterest was just a fun place to share photography inspiration or tattoo ideas with my sister. Little did I know that Pinterest was this large search engine that over 150 million people use on a monthly basis! But once I got my head around the fact that Pinterest was a search engine and not a social media channel, my gears started to turn. I wanted to know more and more and I wanted to learn the ins and outs of how to conquer Pinterest. So that’s what I did. I started with some research on Pinterest SEO and what others did to grow their Pinterest account. From there, I went off running! Ready to take on whatever Pinterest threw my way. 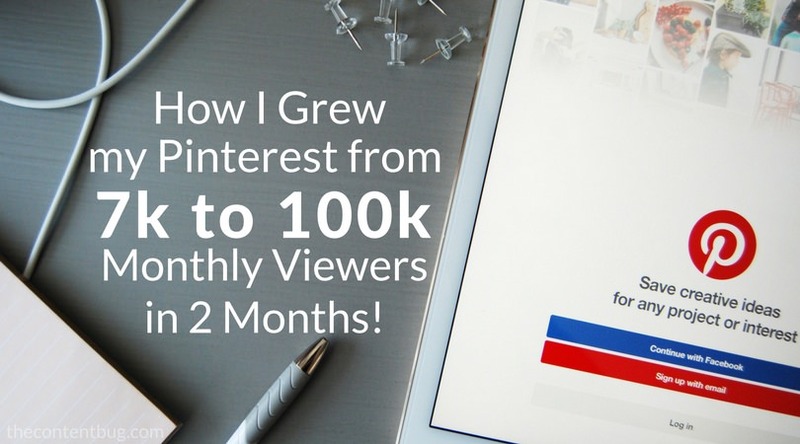 And with this post, I’m going to share with you exactly how I grew my Pinterest account from an average of 7,000 monthly viewers to 100,000 monthly viewers in just 2 months. I want to lay all my cards on the table for you guys. 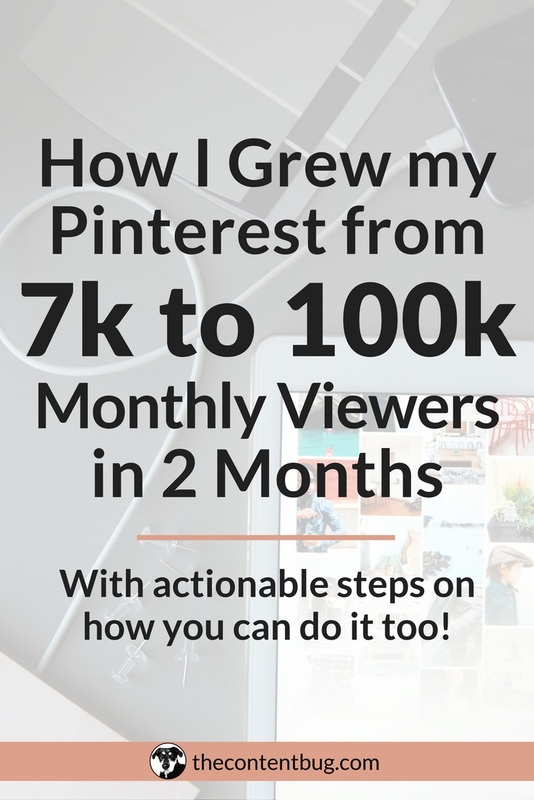 So you can understand how an average girl like me can achieve 100k monthly Pinterest viewers and so can you! It doesn’t take someone with superpowers. It just takes someone who is willing to work for it. So in just 4 months, I increased my Pinterest following by 412%. I grew from 163 followers to 673 followers. How the heck?! My 2017 goal was to reach 1,000 Pinterest followers and I’m almost at the goal already! And by May 5th, my Pinterest account had an average of 101.9k average monthly views! Insane, right? You may be wondering: “How does someone with only 600 some followers get so many monthly views?” Well, slow down a bit. I’m getting there. There was no one simple trick that made me get to that stage in my Pinterest game. There were a lot of different elements that helped me to increase my reach on Pinterest. And I’m going to show you everything I did so that you can follow the same steps to improve your Pinterest game. So are you ready to get down and dirty with your Pinterest account? Go grab yourself a cup of coffee, or a glass of wine, log into Pinterest, and let’s get this party started. I used to spend a lot of time surfing around on Instagram to see what successful accounts included in their bio. And then I would craft my bio to be a spin-off of what I found other people were doing. Well, it is important to do the same thing on Pinterest! And lucky for you, I already did the research and am here to tell you what I’ve found. Your name is your first impression. It is the first chance to tell people and Pinterest who you are and what you do. And after my research, I noticed that almost all successful Pinners have 1 thing in common: They include their first name followed by a vertical line, then they include their specialty. So I changed my Pinterest name from “CATH” to “CATH | Online Content & SEO Tips”. Now from that name, can you tell why I made the change? It is so much more descriptive and allows me to reach my audience from the very beginning! UPDATE: Pinterest now has a 30 character cap on the length of your profile name. By doing this, I now appear for the keywords “Online Content” and “SEO Tips”. And this is great because people can come to my profile and find various boards to help them with what they are looking for! Your bio is a great opportunity to not only tell people who you are and what you do but to also sell them on something. And it doesn’t have to be a product that you make money from. It could be to get them to sign up for a free e-course or join your email list. As long as you have a conversion in mind, this is a great spot to engage your audience! Don’t waste this prime real estate talking about nothing. Take it from me… This was my bio in January. This bio is a lot more descriptive, right? HECK YES! It even includes a call to action that gets people fired up and ready to do something at this very second! And I don’t want to make a quick sale… I want to feed people helpful information so that they can tackle their online presence. And hopefully, they come back to my site for more information. Make sure that your Pinterest account picture is a picture of yourself. Make it a close-up, not a whole body shot. This will make your page seem more personal and look there is an actual person behind your brand and not just a robot. So remove that logo and add a picture of yourself right now! This will make all the difference in your first impression. If you would have told me 4 months ago that you needed to SEO your Pinterest boards, I would have told you that you were crazy. But it’s not as crazy as I thought. And actually, it is extremely important to your Pinterest success. By SEO-ing your Pinterest boards, you increase the chance of your boards, pins, and account to be found in search. AND when you include keywords in your profile name, your Pinterest board titles and in their descriptions, then Pinterest trusts that you are being honest and are an expert in that area. So don’t let Pinterest down! SEO your Pinterest boards today… seriously, it worked wonders for me. Before I started to take my Pinterest seriously, I had fun titles for my boards. My food/recipe board was named “Yum Yum” and my wedding ideas board was named “Someday”. Do you think either of those names would help with my SEO? Nope! After some research, I learned that your board names need to be descriptive and to the point. You want to take the name literally. And you want to include important keywords in the title. So if you take a look at my Pinterest account, you will notice that all my titles are very simple. You know right from the beginning what to expect from the board, and there are no hidden surprises. The descriptions of your Pinterest boards are extremely important to improving your Pinterest SEO! When I was using Pinterest for fun, I didn’t add descriptions to my boards. And that was fine for the time. But once I wanted to take my Pinterest game seriously, I had to take some time to write descriptions. These need to be specific and detailed. You want to include important keywords and the title of the board in the description. This will help you to rank in a Pinterest search! 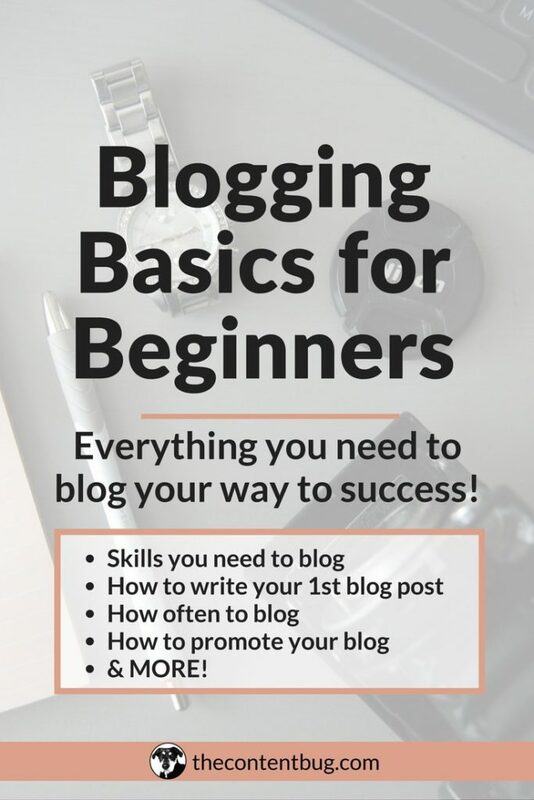 In this description, I included the title of the board (kinda), what the board includes, and other important keywords such as “basics of blogging”, and “blogging beginner”. You want your descriptions to be something like this. Include a question to gain interest and include the board’s title. And remember to include other keywords while you talk about what content you plan to share on the board. And once you combine all these together, you will have a perfectly SEO’d description! After I fixed the titles and descriptions on my Pinterest boards that needed it, I took some time to focus on the pins on those boards. And you need to do the same! Take a look at your Pinterest boards. How many pins are in each of them? Are there over 1,000 or less than 50 in each? All your boards need to have at least 50 pins in them. And each week you need to add new content to each of those boards to keep them active. So it doesn’t matter if one of your boards has 587 pins and another has 34. You need to start by focusing on your smaller boards to build them up to hold more than 50 pins. Once all your boards have over 50 pins in them, you need to review the quality of your pins. Are there any broken links or article pins that don’t lead anywhere? You need to be careful that every pin your share is high-quality. And if you are wondering what I believe to be a “high-quality” pin, then head to the next section. This is critical to Pinterest success as Pinterest revolves around high-quality pins. So you need to continuously create and share high-quality pins that other pinners will enjoy. Now, there are a lot of elements that determine if a pin is high-quality. 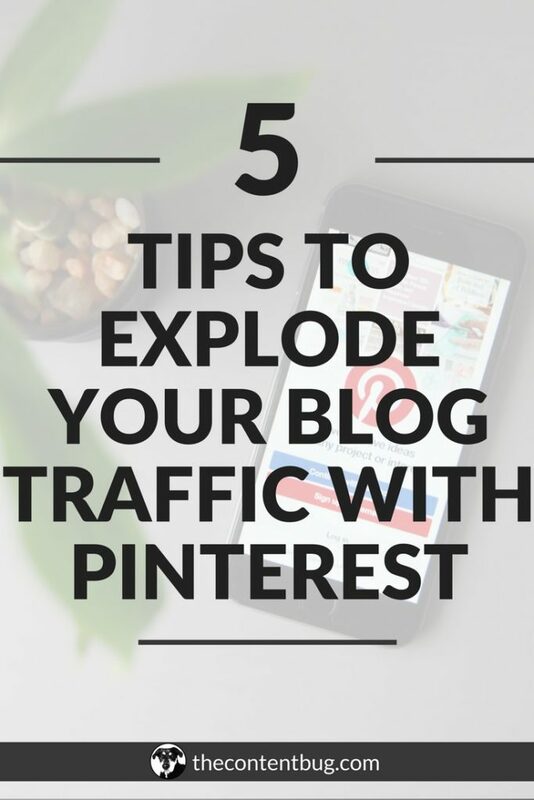 It doesn’t stop after you write a blog post and then share it on Pinterest without any thought. You need to consider the image, the title and the description that is attached to your article so that the pin is well-rounded and… high quality! So let’s take a look at some areas that helped me to create high-quality pins for my Pinterest profile. If you want to be taken seriously on Pinterest, then you need to get approved for Rich Pins. Now you may my looking at your phone or computer thinking that I have 5 heads. But I swear, I just have one head that is screwed on semi-correctly. Have you ever noticed that some pins have a bold title attached to them while others just have a description? The pins that have a bold title are called Rich Pins. And you can learn all about them and what you need to do to set up Rich Pins for your website with my blog post right HERE! 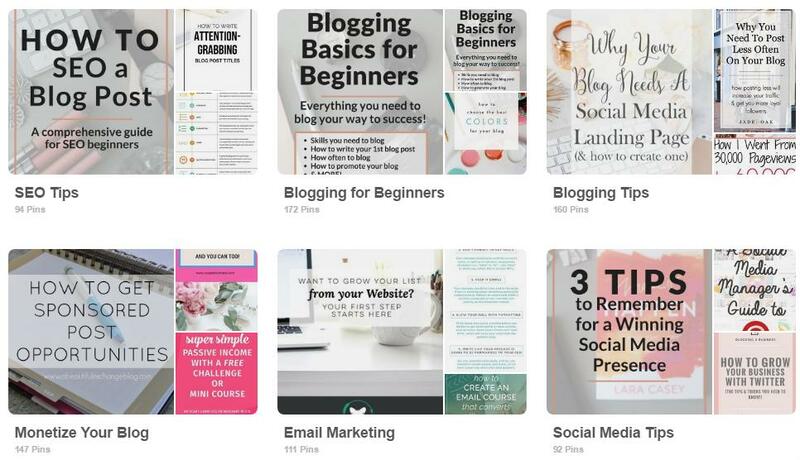 This is one thing that I did from the beginning because I knew how important it was for the success of my blog posts on Pinterest. So I highly recommend you go get approved for Rich Pins right now! Images on Pinterest are just as important as your images on Instagram. They are what attracts people to click and share your pin. And most of the time, without a quality image, I won’t share a pin, nonetheless read it! I use Canva to create my Pinterest images. And since I started my blog about 4 months ago, I have changed the look of my pins 3 times. And I think I am finally at a point that I love my Pin design. When you create images for your Pinterest account, you need to think of the template that you will use for each. You don’t want to create a different design each time! Create something that is a good representation of your brand and that you would be happy with months down the line. Here are some important areas that you need to pay attention to. Image size: If you use Canva, they have a template size called “Pinterest Graphic”. This is the recommended size for a Pinterest image. And if you don’t use Canva, then you need to create an image that is 735 pixels x 1102 pixels. File size: You need to shrink the file size of your images before you upload them to your website and Pinterest. If the image is too large, Pinterest might not load the image resulting in a blank pin. You want to avoid this! So before you use an image for a pin, run it through a file shrinking software. I like to use JPEGmini by BEAMR for all my images. Readability: Your audience needs to be able to read the pin easily. And the best way to ensure this is to use a simple, clean, crisp font. Avoid cursive, or anything too fancy! And if you are creating images to be used for blog posts or articles, then you need to use a font that is large enough to command the image! It should be easy to read without clicking on the pin and it should be the first thing the Pinterest user sees. The last area of a pin that you need to pay attention to is the title and description. Now, when you have Rich Pins set up, Pinterest automatically pulls the title of the article or website page that you are linking to. So you need to make sure that you create the article/post with a great title to begin with. And to do this, I like to use the CoSchedule Headline Analyzer. This tool reviews your title and tells you what areas you need to improve. So before you select the title you will use, I recommend using this tool! All your titles need to include important keywords that you are trying to rank for. And you need to include these keywords in the content of the article. So choose your keywords and title carefully. Now, when it comes to the description, you need to include those keywords as well. Complete a generic search on Pinterest about the topic of your article. And then take a look at the recommendations it gives you. Based on these recommendations, make a killer description. Now you have a well-crafted description that includes multiple keywords to help your article rank well in search! Nothing new here. Group boards are great if you want to improve your reach on Pinterest. But it is more than that. If you are a beginner blogger, then you need to get your foot in the water with bigger bloggers! Don’t just join every group board that you come across. Be strategic. Check out the person that owns the group board. How many followers do they have? Are they still active on Pinterest? If they have 30 followers, then you need to aim higher! And if they aren’t active on Pinterest, then you need to find someone that is. The group boards that bring me the most success are the ones that have over 2k pins. And their owners have over 2k followers. This is great because you aren’t just reaching the 30 followers of the beginner blogger. You are reaching 2,000 followers of someone who has earned a great following. I would recommend that you strive higher than those people with 2k followers though. Try to get on a group board of someone who has over 5k or 10k followers. This will work wonders for your Pinterest reach! And don’t just stop at 1 group board. I am a part of 9 group boards and am actively looking to find higher quality boards to join. I’ve already talked about how Tailwind helped to increase my blog traffic by 191%, and now I’m going to talk about Tailwind again! I love this scheduling platform and it has helped to grow my blog and my Pinterest account in ways that I could not do on my own. The one thing that really stepped up my Pinterest game was sharing more pins. I’m just one person. I don’t have time to post 20 different times a day. And sometimes, I don’t even have time to pin once a day. But with Tailwind, I don’t have to worry about it! I take about an hour a week to schedule over 250 pins to be shared throughout the week. By doing this, my Pinterest account is always active and it reaches more users than ever before. When I first started to use Tailwind, I had a little over 1,000 pins on my Pinterest account. Now, I am well over 4K! In just a few months, I’ve shared 3,000 high-quality pins, that my audience gets to interact with on a regular basis. I owe most of my success for growing my Pinterest account to Tailwind. It has worked wonders and takes care of all the hard work for me. So that I can sit back and work on other important areas of my website that need my time. Now it’s your turn. 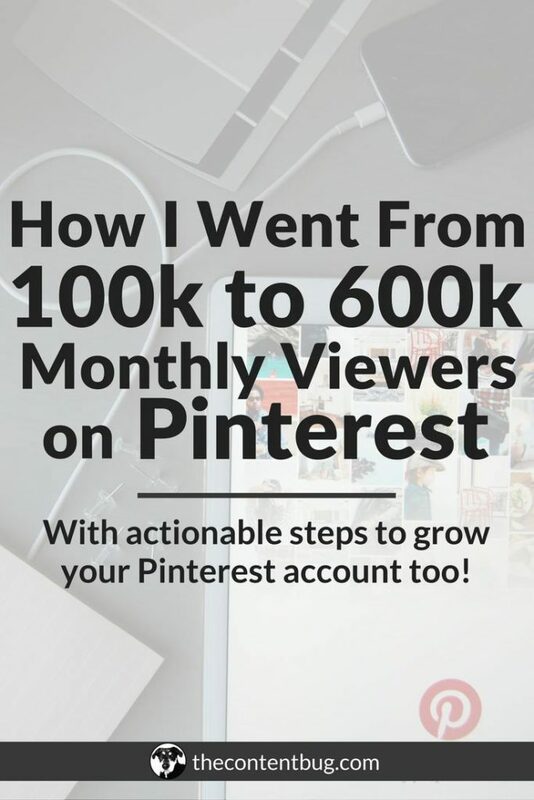 You can take control of your Pinterest account today to reach over 100k monthly viewers in just a month or 2! Some aspects of improving your Pinterest account, including your profile and your boards, don’t take that much time. But the long-term success comes from the continued sharing of high-quality pins. So if you want to take Pinterest seriously, then I would highly recommend Tailwind. Using a scheduling tool is the best way to grow your reach in no time! And the best part is that you can try Tailwind for free today. They provide all new users with 100 free pins for a trial phase. After that, it only costs $9.99 a month, which is an amazing price for the results that you will see! And if you are still not convinced, head on over to my blog post on how Tailwind Helped to Increase my Blog Traffic by 191%. In this post, I cover the ins and outs of how I use Tailwind. Plus you get an inside look at the platform so that you know what you are getting into. Okay, okay. I know you don’t want to hear about another paid course or online product. But since you’ve gotten to this point in the blog post, I know that you are committed to growing your visibility online. So what if I told you that you could get your hands on more action-packed strategies just like this blog post? Strategies that would help to double your monthly page views, improve your email list to generate over 100 email subscribers a month, and completely master SEO so you don’t have to worry about constantly promoting your blog to receive traffic. Including the latest changes to the Pinterest platform and what you need to do to increase your visibility even more! I mean wouldn’t that be awesome! 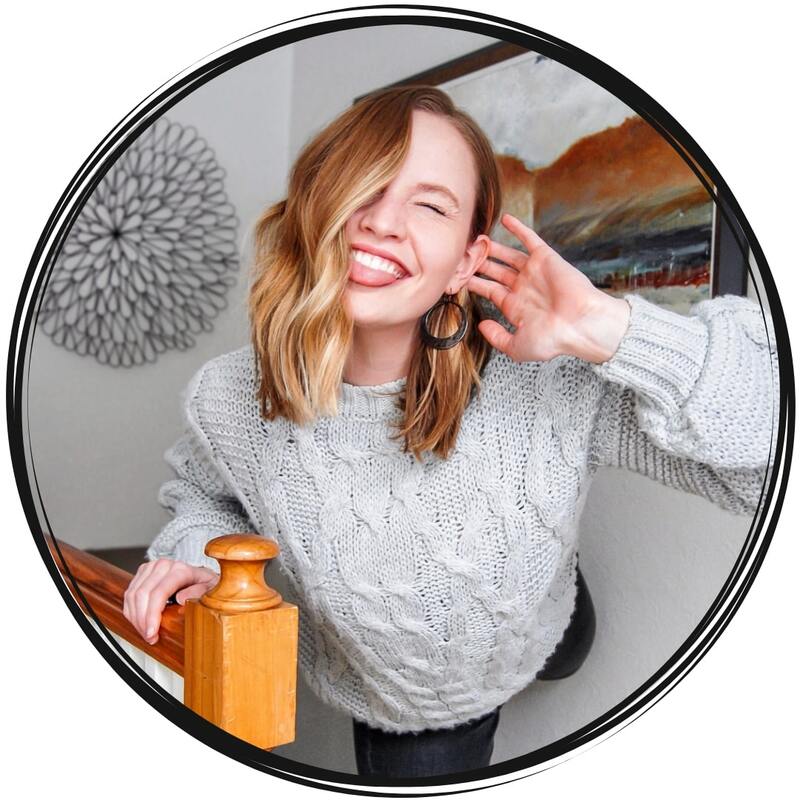 I’m sharing the exact strategies that allowed me to skyrocket my blog’s growth in just 3 months and at the end of those 3 months… I was able to leave my full-time position and take my blog biz full-time. And I’m sharing EVERYTHING in my ebook, The Blog Hustler! 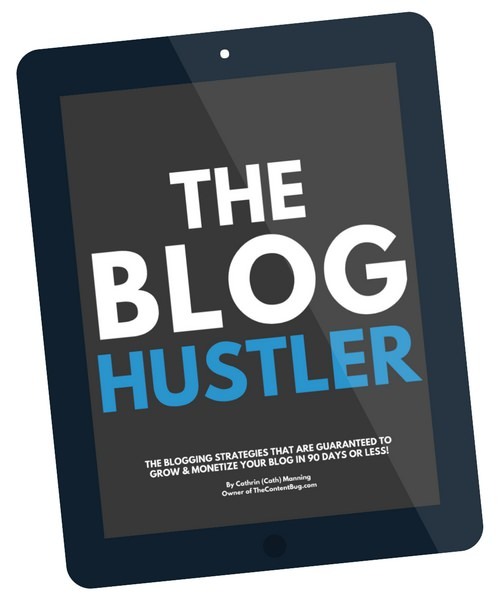 Find out what’s inside The Blog Hustler ebook. I’ll see you in another blog post real soon. PS. Did you know what I could actually help you grow on Pinterest personally? Yeah, that’s right! I offer special Pinterest services to help you set-up, clean up, and evaluate what you’re doing right and wrong to make sure you’re doing everything you can to improve your visibility on Pinterest. Find out more information. Of course! Pinterest and YouTube both have SEO that you need to pay close attention to if you want to grow. 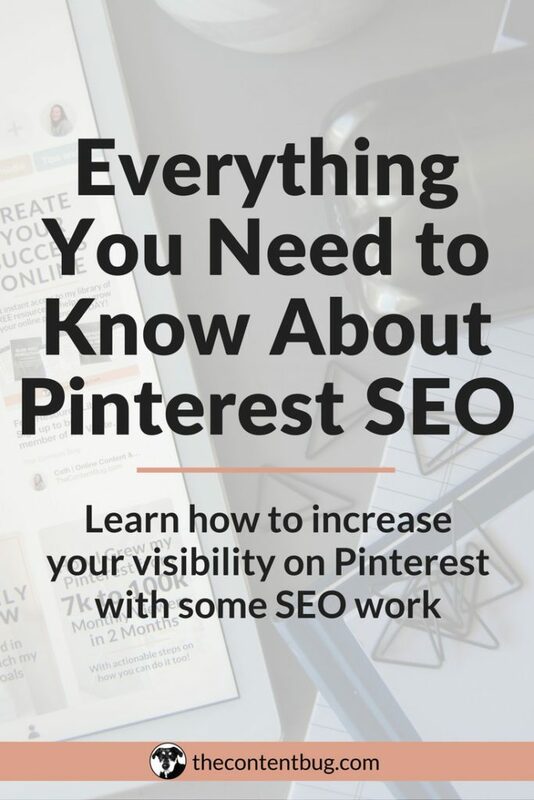 Make sure you check out my Pinterest SEO blog post to learn more! Cath!!! This was awesome. I have been trying to understand what I need to improve on as a new blogger. Bam! You nailed it! THANKS!!! I’m so glad that you found it helpful! I love your spirit 🙂 Keep up the good work and let me know what results you have! This was so helpful. I am sharing this in my blog group on FB. We are all new bloggers trying to figure it all out. I know this will answer lots of people’s questions about Pinterest! That’s so awesome! I’m glad you found it helpful and saw results so quickly! Awesome tips and resources. Thanks for sharing! I have been using these great tips and my traffic has been increasing more and more. And I think it’s the SEO and Pinterest combining that’s doing it. I will working on it to get more traffic and followers. I’m glad that you’ve been seeing results! That’s amazing! i want to buy the ebook is it on kindle though?! I’m currently working on making it available on Kindle but right now it’s just available as a PDF! Wow! What an amazing article with some great information. Thanks!! Thanks! These are some helpful tips that I can actually use! Great, actionable tips. I’ll use them and keep you posted. Thanks! Great article! Starting using your tips and Tailwind two days ago and went from 2 monthly views to 31! That’s not a huge number but that is from under 10 pins which took me 15 minutes to schedule the rest of the month! Possibly unrelated question…. Little confused about pinning my own work to boards. Should I have boards dedicated to MY photos or have a mix of mine as well as images I like and want to repin? Especially when I may not have new content to share but wanna keep pinning…Hope that is clear! That’s so awesome! Keep up the good work! To answer your question, you should have a board dedicated to only your photos! And then on your other boards, those should be a mix of your content and other people’s content. But it’s nice to have your first board to be a brand board so if people just want to see your work, you have a portfolio right there for them to look at! Such a great article! Thank you so much! Wow. This is probably THE MOST actionable marketing article I’ve EVER read. I’m so excited to start using these tips- THANK YOU! When I go to type in my name like you did, it says “please enter no more than 30 characters.” Are you using a business account or a personal account? It’s a business account! A few months ago Pinterest changed their standards on the length of your profile name. So sadly, you can’t include a name longer than 30 characters. Thank you for the valuable content! Wish I had found your post before I (re)started on my blog. My Pinterest and blog views are on the upward trend right now but there are a few processes I have to improve on, and this comes in handy. Your post is definitely one of the most detailed one on Pinterest. I will be following your other posts. Thanks! I’m glad you found it helpful! If you have any other questions, please let me know! Great article! Thanks for the tips… How many pins would you say I should be doing a day? how many are should be mine and how many should be others? Right now they are recommending that you pin no more than 50 times a day. I say around 30 to 40 pins a day should be your sweet spot. And make sure that 30% of those pins are yours and 70% are from other people! Loved the post since it is packed with great information. Also, gives me the motivation to get back to my blog which I had put aside for a while since I was / am having tech issues getting it up and going. Thanks so much for the quality content! Of course, Debra! I’m happy to help! If you have any questions, or if there is a blog post you would like to see, just let me know! Great information Cath. Thank you so much. Just signed and applied for Rich Pin because you. Really useful and informative post. I’ll be bookmarking this for future reference. Thanks! Great article and tips. Do you have any thoughts on the current state of Pinterest. I have read no less than 5 no more than 10 pins a day. I feel like this doesn’t let me hit all my boards. Do you think group boards are on their way out? Any help is appreciated I grew fast with these tips but now I can’t seem to get anything seen. Pinterest has made a lot of changes in their algorithm over the past year. And one of the biggest changes that is affecting bloggers is group boards. They aren’t happy that group boards are being used for distribution instead of real collaboration. They aren’t going to hurt you if you use group boards, they just aren’t promoting them as much. People want to actually see content from the people they follow not from other people who pin to their boards. And if that’s the mindset of people on Pinterest, then Pinterest wants to do whatever they can to make their users happy. When it comes to pinning less than 10 pins a day, I don’t believe that’s true. I just attended a private webinar with Tailwind talking about their new SmartLoop feature and they told us some of the changes Pinterest made and how they are working with them to make Tailwind better. And they said to continue pinning at least 20 pins a day. You want to stay active on the platform! If you aren’t active every day, then Pinterest won’t reward you and your pins. The most important thing you can do to see consistent growth on Pinterest is to keep up with their latest changes and strategies. I’m always writing new blog posts with tips and I’ve recently launched my TCB Vault which will always be filled with the latest Pinterest information for my audience! THANKS! I appreciate this a lot! I will look into the vault. Thank you for this amazing article. I will take some of this info and enhance my Pinterest profile. This is a well written article on how to get more Pinterest followers. I am definitely going to use this very important information about getting more Pinterest followers, because I don’t have but a puny 78 Pinterest followers at the moment. And I have been doing lots of things to try and get more followers. But nothing has worked for me yet, but I truly believe this article will help me get more Pinterest followers. Well I hope you find these tips helpful! Let me know if you have any other questions! So I pin a mix of my own pins and other people’s pins. I like to think that it’s actually a 30% to 70% balance where 30% of what I pin is my own content from my website. And the other 70% is from others! So when I share about 40+ pins a day, I make sure that I have my pins schedules to be shared ever 5 pins or so! Just to make sure I’m sharing quality content while also promoting my own work! I agree with all that you say about Pinterest. I do pin regularly with SocialOomph. But, that doesn’t allow me to share Rich Pins. I really need to look into Tailwind. I have long been aware of it’s existence. I have just never looked into it. I got started on Tailwind about a year and a half ago and I’ve loved it! Plus they keep coming out with new features and are looking to launch a looping tool here soon! So I’m excited tog eat started with that. Such a great article, and judging buy the fact that I was brought here by Pinterest, I definitely think it works. Just spent and hour cleaning up the category and titles of my MANY MANY boards. I try to keep things super organized, but I’m not always so sure it helps in the eyes of other people. Thoughts on using an organization system for Pinterest boards? Eg. I’ve put “Holiday:” infront of my different holiday boards (Easter, Halloween, etc.). Check it out and let me know your thoughts!!! Cleaning up your Pinterest boards can be a lot of work, but totally worth it! When it comes to the organization of your boards, I recommend always having your website or blog board first. Then go in the order that you think is most important or relevant to your brand! Like you, I have a Social Media Tips board and beside that board are my Pinterest, Instagram, and Facebook boards. So I do think it is important to keep similar topics together like you said with your Holiday and various specific holiday boards you have created. I absolutely loved this article!!! This is fantastic information, and I think I’ve referred to it at least 10 times. I hope to increase my Pinterest traffic with this info! Thank you again! I’m so glad that you sound it helpful Charleah! If you have any other questions, just let me know! Hello cath, no words great content one should definitely implement this, thanks for sharing! Came upon your post on (SURPRISE!) – Pinterest. Noticed you are also in Rochester, NY trying to grow your blog as well. We are based in Rochester, too and just wanted to say hello! Good luck in all you do! Can’t wait to read more about how you grew your following. Thanks so much! I had never heard of Rich pins. I did as you suggested to activate them and my impressions went up over 1000% overnight! Hey Cath….. I’m artist , I like to paint and draw and I would like to learn some techniques to make my arts visible to many viewers…. This is a fantastic article about Pinterest and as I was reading I was updating my Pinterest site. I really appreciate that you really delve into your points here and you’re not just spinning in circles trying to sell some affiliate’s eBook! (I’ve see that far too many times). Thank you for sharing things that we can take away from here right now! I’m so glad you enjoyed the post and found it helpful 🙂 That’s always my main goal! Wow! I have to say this is the most clear and concise explanation. It’s hard to find straight forward advice. I’ve been on Pinterest almost since the beginning and my boards are a MESS! I’m going to start organizing my boards, clean them up and creat some nice Rich pins for my blog. Thanks so much for this Cath. When I started using Pinterest, my boards were a mess too so I understand! You’ve got this! I have purchased numerous books, read countless articles, attended “free” webinars…. this is without a doubt the best article I have read! Thank you so very much Cath for sharing your wisdom! If you need any help with that website let me know! Just an amazing, direct to the point….to do list! So you should write the next Pinterest to do book! You’ve got this nailed! Thank you for this wonderful article it has been very helpful. I do have a question. When using Tailwind is it recommended that I do no pinning myself and let Tailwind do all of the work or is it recommended that I do some pinning along with Tailwind? If I need to pin along the side of Tailwind how much of the pinning should I be doing and how much should Tailwind do? That’s a great question. Pinterest likes to see that you are actually active on their site and not just using a Pinterest automation system. So it’s helpful to share pins manually and to follow new accounts every now and then! But schedule the majority of the pins your share through Tailwind that way your account is always pinning. But when you get a chance, share 2 or 3 manually to make Pinterest happy! That will really help with your Pinterest visibility! Great article! Thank you so much for these tips! Can’t wait to get started! So glad you enjoyed it Amy! Let me know how it goes! I watched a boring hour long webinar about Pinterest just this week (well I clicked off it before the end because basically 40mins of sales pitch & zero of actual how to be better at Pinterest). This post is so amazing, the best I’ve read about increasing my account and getting active web clicks. Also, I appreciate that you’re “just a regular person” and not someone with a million followers (cause that seems way too hard to replicate). Thanks so much. I’m so glad that you found this blog post helpful! Pinterest is relatively easy to grow if you have the right information! So I’m glad I was the regular person that helped you to grow your account! If you ever have any other questions, just let me know! Hi I have been doing draweverydays for the past year, suddenly my monthly viewers have gone to 1 million a month, this is quite good right? Do you have any articles etc that could be useful to enable me to help monetise this etc? I actually have a whole blog post on how I monetized my blog in my first year! So feel free to check that out. So, something I’m not feeling like I’m catching on to is, do we need to just pin any content or pin content that leads to our own blogs? I don’t think I have 250 pinnable images to share out each week on Tailwind. And if it’s other people’s content that we re-pin, how does that help my blog traffic grow? I’m only recently finding out about this whole Pinterest as a money making game thing rather than as a fun thing to browse through for enjoyment. You don’t just want to pin “any” content. You want to pin content that is related to your specific niche. But it doesn’t have to lead back to your blog. Here’s the thing, you want to pin 20% of your own pins (pins that lead to your blog) and 70% of other people’s pins. By helping other bloggers on Pinterest, simply by pinning their pins, Pinterest will take you as a quality content creator. And in return, Pinterest will help to boost your account and your pins. This will increase your visibility on Pinterest and in return improve your blog traffic helping your blog grow! So you don’t just want to pin your own stuff. You need to be pinning other people’s content as well! I have read your post over and over and am working on increasing my boards and pins. Great content! I have two questions if you don’t mind. -I blog in Spanish, should I only include Spanish content in my Pinterest? -And, how do you check that the pins you are choosing are high quality? I guess I have not understand that! That’s so awesome! I’m glad that you found it helpful! – If you only blog in Spanish, then I would recommend sticking with Spanish content. You want to make sure that you are consistent with your audience and sharing other information that they may enjoy. However, if you think that your audience may be bilingual, then go ahead and share other content that still follows your niche! – When it comes to the quality of the pin, I look at a few things. First, the image. I only pin images that are the right vertical size for Pinterest. Some people use extra long pins, but that’s not best practice for Pinterest. So I trie to avoid those. Then I look at the description. If there is no description, then I don’t pin it! It has to be detailed and accurate. And lastly, when I use Tailwind to schedule pins, they check the make sure the pin is attached to a URL. That’s a problem with a lot of pins, they lose their website along the way! I hope that was helpful! Let me know if you have any other questions! Great article Cath! Thanks for sharing. I have done all that you mentioned in the post already and I went from zero to 22k views in 30 days. My biggest hiccup so far is joining group boards but I will keep trying. That’s so great to hear! Pinterest group boards are hard. And I’ve gotten a lot of comments asking about them! So if you ever have any questions, just read some of the comments below or send me an email! I’d love to help! Hi! This is a really helpful post, thank you! 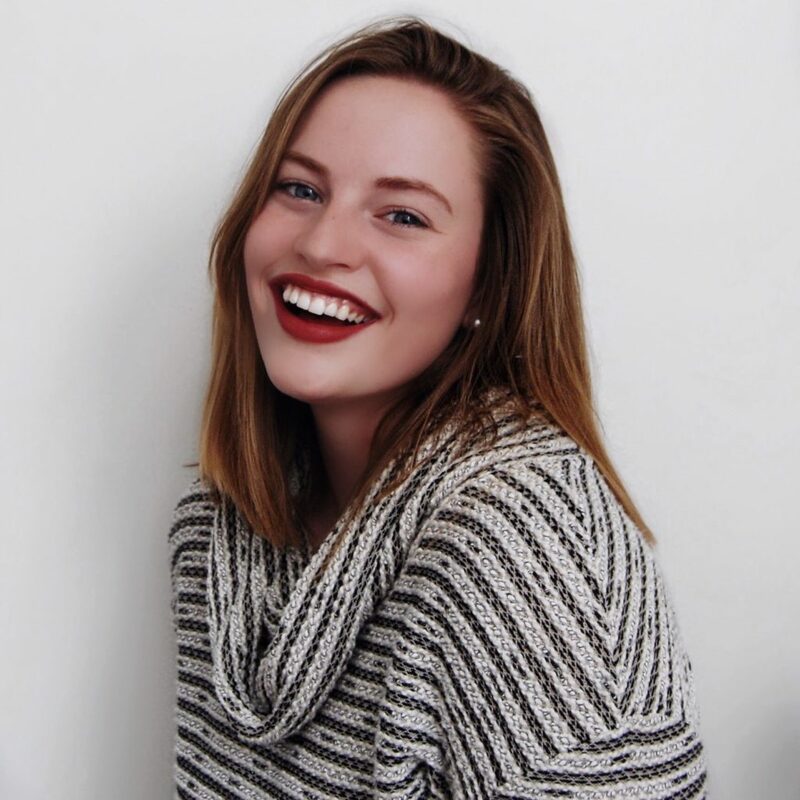 I’ve had a business account for a while, but I’ve only recently started focusing on using it to grow my site. So for most group boards, there are instructions in the description on how to join. And usually, you have to just email the person that owns the board and follow them on Pinterest! However, each one is different. I’ve never seen one where you have to comment. That seems hard to track, especially since Pinterest does not focus on commenting too much! I would try to find ones where you have to email them to join. When I first started using group boards I sent out a lot of emails and only hear back from a few. And then after time I just started to automatically get invited to them! So keep sending emails and try to get some really great ones! Nope, it’s not normal to not have the option to comment on pins because of having a business account. Mine is a business account and I can comment. I absolutely love this post, thank you so much for all this awesome information! This article really helped me with my Pinterest account. Thank you for going step by step on how to build a better Pinterest account. I’ve started to implement some of the things that were said in this post and have seen a real difference. I’m so glad that you found this article helpful! And I’m even more excited that you are starting to see a difference! Make sure that you track your results and let me know how much your Pinterest has grown! Wow, I’ve been reading a lot of Pinterest articles and this is one of the best! It never occurred to me to SEO my profile name and even my board names. I’ve been working on SEO on my descriptions and titles but this takes it to another level. So many good and specific gems here that I look forward to putting into action. Thanks! Thank you so much! I’m glad that you found this article helpful! When you include keywords in your profile name and the titles of your boards it really makes a difference! And the best part is that it really doesn’t take that much time. So go and do the work now and see the reward in a month with your analytics! Hi Cath, this is a great article! I have a truly rookie question. What exactly does SEO stand for? SEO stands for Search Engine Optimization. I have a variety of blog posts on the subject if you want to learn more! I even have a beginners guide to SEO that explains everything you need to know! And of course, if you ever have any questions, just let me know! Oh no way! What a small world! Thanks so much for this. Trying to figure out Pinterest is so confusing, lol. I have Tailwind, but never use it. Will try and get it sorted this month. Pinterest definitely can be confusing! And when I first started with Tailwind I didn’t use it either because I didn’t know how it worked. But once I bought the paid plan and walked through their tutorials, it really changed my Pinterest and website game! I have a few questions. I also was like you and only used Pinterest for fun as a way to tag vacation spots, tattoo ideas, food, architecture, etc.. I have around 3000 pins which I found by simply searching stuff that interested me. However I recently made a blog and want to use Pinterest to gain traffic. Should I use my existing account and change the username and email for what I use for my blog or should I create a new username from scratch?what about all my pins of other users content that I have on all my boards. Should I delete them all and only pin my own stuff from my article or leave around 50 of them. Should my boards only be pins from my site and do I only use tailwind to schedule pins from my site? Thanks for reading. And thanks for the questions! These are some that I’m sure other people have as well. What I would recommend doing is just changing the username and email of your current account. It’s better to have had an account for awhile instead of starting a brand new one. Platforms like to see that you have been there for a while in order to trust you. But what I would recommend is purging the boards that don’t match with the topic of your blog. And that could mean simply putting them on secret mode so no one sees them! When sharing content on Pinterest, you need to have 1 board that is specific to your blog. So only your website content goes on that board. But for all the other boards it should be a mix of your content and other people’s content! So don’t delete their content unless it doesn’t align with your niche. Try to stick to 80% other people’s content and then 20% your own. If you are just starting out this could be hard, but it will become easier in time. And I would use Tailwind for all types of content. So your content and other’s content! It helps to keep you active especially if you are following the 80-20 rule. Then you need to mix up when you are sharing your pins for the best results. Thank you! This is the most helpful page I’ve found since researching how to get my blog started and recieve traffic from Pinterest. One last question. Should I pin multiple pictures from the same blog post to my websites dedicated board and my other boards or should I stick to one picture to pin per blog post? For example if I have 5 great pictures from a blog post should I pin them all or choose 1. It would be much harder to have 250 pins from 250 different blog posts. Sorry if this is an amateur question I’m so new to this! Thanks again you’ve been a huge huge with this post. This isn’t an amateur question at all! It’s a great one! That’s such a great question! When it comes to group boards, I would recommend looking at similar Pinterest accounts and what group boards they are a member of. When you click on a group board, typically the owner will have entered a description that outlines how to join the board. Usually, that means you have to follow their account and send them an email requesting to join. Now when it comes to joining group boards, you need to be careful on what boards you join. Take a look at the owner of the board and see how many followers they have. If they have a low number, then that board might not be helpful to you. Then take a look at the number of pins that are included in that group board. If it’s less than 3,000, then you might want to find a board that has more pins. And the last thing is to pay attention to the quality of the board. If you are looking to join a Dessert group board and you notice that people share pins about travel and personal blogs, then this might not be a quality board for you to join! But once you have found some that you would like to contribute to, check out the description. Usually, all the information you need is right there! This is such an amazing and inspiring article on how to up the game on pinterest! I’ve attended webinars and have read other articles on how to improve my reach through pinterest, but something about this article helped it just click. I’m so glad I came across this, it was super useful. I started implementing some of your suggestions while reading this, and I’m hoping it will help me out a ton. Thank you for all the actionable steps to improving pinterest traffic!! I’m so glad that you found this helpful! Sometimes it’s nice to know exactly the steps that you need to take to get going. Trust me, I still search for those articles. So I try to provide them to my audience any chance I get! Optimizing for search is so important! I need to keep working on mine. Thanks for the great tips! Great article for improving your following on Pinterest. I am starting brand new, so I am trying to avoid as many mistakes as possible and get started on the right foot. It’s important to remember that you’re going to make mistakes! And doing something and moving forward is better than waiting on it to be perfect! Take you Pinterest SEO chunk by chunk and you’ll get it done in no time!